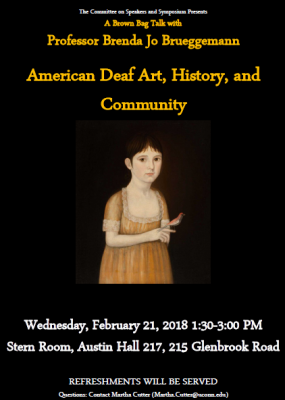 On Wednesday, February 21st at 1:30 PM, the English Department’s Committee on Speakers and Symposium hosted a Brown Bag Talk with Aetna Chair Brenda Brueggemann titled “American Deaf Art, History, and Community.” The event took place in the Stern Room in Phillip E. Austin Hall (Austin 217). Thursday, February 8th, at 5:30 PM, Aetna Chair Brenda Brueggemann Spoke at the New Britain Museum of American Art (NBMAA) on American Deaf Art, the community surrounding it, and its place in art history. For more information on the event, follow the link below to the museum’s website.